We have three sets of lessons for adult beginner/intermediate classic skiers running in February 2019. The perfect Valentine’s gift! Each set includes four lessons over four weeks, as follows. Lessons cost $80 plus a $40 trail use fee for non-members. Participants must provide their own boots, skis and poles. If you don’t have equipment, rentals are available at Overlander Sports. Any ski rentals at Overlander include access to our trails, which means non-members who rent skis save $40 on trail fees. Conversely, members of our club receive a 10 per cent discount on new ski equipment at Overlander. Registration is now open for the Frostbite 50 on March 16. Ski club members get a 20 per cent discount on registration (see your inbox for the code, which just went out in a newsletter). What’s the Frostbite 50, you ask? 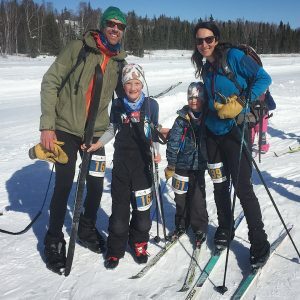 “The Frostbite 50 is a 50 km continuous snowshoe or classic ski event on ungroomed trails near Yellowknife. Participate solo or as a team of up to five participants. There are four road-accessible checkpoints, and participants are welcome to have support along the way. This and more on the Frostbite 50 website. UPDATE: This event has been moved to Sunday Jan. 13. For anyone interested in joining our trail grooming crew, consider attending our introductory grooming workshop at the chalet. The workshop starts at 9 am and runs to 3 pm. We’ll be indoors (talking theory and safety) in the morning and outdoors with the equipment (and some of our grizzled veterans) in the afternoon. Lunch is provided. Our all-volunteer team of groomers currently groom the trails three nights a week, with three separate teams on each evening. We’re aiming to increase the pool of volunteers and start developing new crew members. To register or learn more, contact Trails Director Chris Hotson at christopherhotson@yahoo.ca or 445-3396. NWT Ski has named Team NT for the 2019 Canada Winter Games taking place in Red Deer, Alberta this February. They are: Nicolas Bennett, Jack Panayi, Ella Kokelj, Clair Littlefair, Jack Kotaska, Kea Furniss, Ruby Piggot, Rae Panayi and Donny Boake (but not Spencer Littlefair or Makoa Kokelj, as previously, and incorrectly, reported). Every one of these skiers was nurtured at our very own Yellowknife Ski Club. Thanks everyone for supporting them! Heather Scott (pictured here with skiing family) has kindly stepped forward to take on the role of president and, barring unforeseen scandal, will be officially appointed by the board at our next meeting, Monday Dec. 3. Heather has been involved with the ski club for several years as a coach and all-around volunteer and has two children taking part in Jackrabbits and Track Attack, respectively. In her 15 years in Yellowknife Heather has served on several boards, including the Multisport Club, and is past chair of the YK Playschool and the Northern Territories Water and Waste Association. The board meets the first Tuesday (or occasionally Monday) of each month at 7 pm at the chalet. All are welcome. Find past meeting minutes here. From our trails director, Chris Hotson: “The grooming crew continues to pack snow and develop the base as snow accumulates. All trails have been packed at least once and will be freshened up again on Friday evening. There is still not adequate snow to set track but we are in good shape for this time of year.